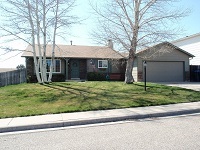 Nice Very Roomy 3br, 3bath, tri-level located in northeast Cheyenne with fence yard/2 car garage. Washer/Dryer Hook-ups. Pets are negotiable w/ $300 per pet deposit. Acceptable breeds only.